Sandberg Å. (ed. ), Enriching Production. Perspectives on Volvo’s Uddevalla plant as an alternative to lean production, Avebury, Aldershot (UK), 1995, 459 p. Digital edition, New Preface, Åke Sandberg, Stockholm, 2007. Digital publication, freyssenet.com, 2007, 5,7 Mo, ISSN 7116-0941. This book of which I wrote a chapter (The Origins of Team Work at Renault) is exceptionally put on this website at editor’s request. It is downloadable. This presentation page is also printable. Please, go to the end of this page. Enriching Production was followed up by a symposium on the general theme of ‘Good work and productivity’. The papers were collected in a special issue of Economic and Industrial Democracy, Vol. 19, No 1, February 1998. There will also be follow up articles on Volvo and alternative production systems in a forthcoming reader Absolut management. Scandinavian perspectives on management in the new working life, to be published in 2012. Both researchers and practitioners in industrial organization ask themselves today whether lean production is the only possible model for the future. Enriching Production proposes a radically different alternative, which was put into practice at Volvo’s Uddevalla plant during its brief life span. Skilled workers in autonomous teams could altogether abandon the assembly line. With a work content of several hours they built cars according to customer order, with a short delivery time, thus avoiding stocks. In spite of its good performance the plant was closed after only a few years without having developed its full potential. Enriching Production explains the design of the Uddevalla plant and tries to understand its closure against a background of organizational politics and Volvo’s production structure. In comparative chapters the NUMMI and Saturn plants in the US and European car manufacturers are contrasted to the Uddevalla model and also to Volvo’s Kalmar plant with still another form of group work. Chapters on social problems with lean production and recent developments in Japanese car manufacturing also contribute to an understanding of where the car building industry and the organization of industrial production is heading. Although the Uddevalla plant in its original form was closed, the vision of competitive systems of production that do not destroy but enhance human competencies and in a a wider sense a human working life lives on. Enriching Production contributes by reminding us that under certain circumstances good and competitive ways of arranging production are possible. The Uddevalla plant: Why did it succeed with a holistic approach and why did it come to an end? Limits to innovation in work organization? Volvo-Gent: A Japanese transplant in Belgium or beyond? Beyond lean production Japanese work policy: Opportunity, challenge or threat? Automobile, Automobile industry, car makers, employment relationships, team working, team leaders, lean production, reflective production, moving line, fordism, taylorism, toyotism, Volvo, Volvo Uddevalla plant, Volvo Kalmar plant, Volvo Gent plant, division of work, NUMMI, SATURN, Toyota, Volkswagen, Renault, Mitsubishi, DAF. Economics, Ergonomics, Management, Geography, History, History of Sciences and Technologies, Engineering, Cognitive sciences, Sociology. ✔ Freyssenet M., L’usine sans chaînes. Volvo Uddevalla. Diaporama. 63 photos. Édition numérique, freyssenet.com, 2006, 13,7 Mo. 2007.03.18, Sandberg Å. (ed. ), Enriching Production. 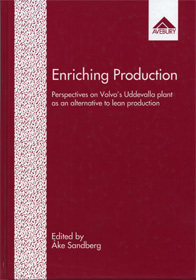 Perspectives on Volvo’s Uddevalla plant as an alternative to lean production, Avebury, Aldershot (UK), 1995, 459 p. Digital edition, New Preface, Åke Sandberg, Stockholm, 2007. Édition numérique, freyssenet.com, 2007, 5,7 Mo, ISSN 7116-0941.